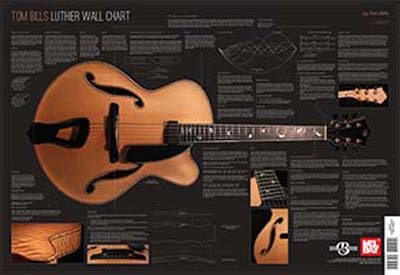 The Luthier's Wall Chart by Tom Bills is a beautiful and extremely useful tool for any luthier's workshop, guitar enthusiasts home, or studio. Tom shares vital information and secrets to creating the best possible guitar or simply making the appropriate adjustments to enhance tone and playability. Essential information is distilled, illustrated, and elegantly displayed to make it the perfect reference tool to help you design and build your masterpiece. Tom Bills is regarded as one of the top guitar makers in the world today with his work featured in the most prominent guitar collection across America and in nearly every country of the world. Tom's guitars are known for their stunning woods, powerful and complex voice, and flawless finishes. Tom is known for his close attention to detail and thorough understanding of guitar physics and its application in creating custom handmade instruments to perfectly match the needs of top players and collectors worldwide. I am going to get a nice frame for this beautiful picture full of information.